My wife and I were talking on Monday about how both Frankie and Floki have suffered from bladder problems but Chris has not. In fact, Chris has only visited a vet for a medical problem once in the almost eight years we have had him. That happened after we adopted Floki last year and he spread his eye infection to everyone in the house. What makes that amazing is that Chris is our resident dry food addict and dry food is a major cause of bladder issues. 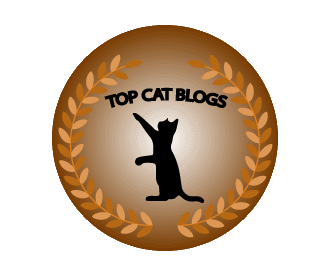 To understand why dry food is an issue, consider where our domestic cats came from. They evolved from the African Wild Cat which is a desert animal. Since water is scarce in the desert, this cat has adapted to get most of its water from the food it eats. Selective breeding has changed the domestic cat from its wild ancestors but they are still very similar. Since cats who eat dry kibble can’t get moisture from their food, they must make up the shortfall by drinking more water than their instinct tells them to. If they don’t, they become dehydrated and develop bladder issues. Of course, just like humans, every cat is different. Some cats drink more water than others, which brings me back to my conversation with my wife, Rose. I mentioned that Chris was probably spared bladder issues because he drinks more water than our other cats. I would even say I see him drinking at least as ofter as the other three cats combined. That’s when we decided to go to Petco and buy a water fountain. 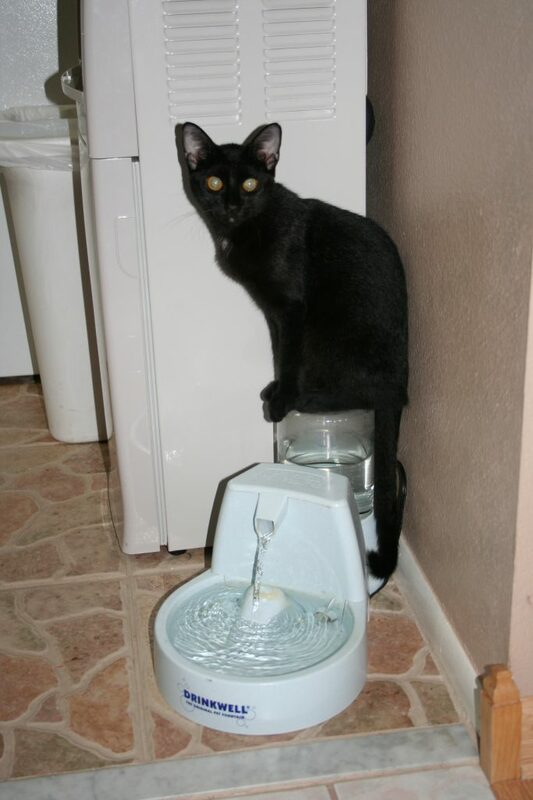 The general consensus is that water fountains get cats to drink more and we needed Puck to drink more. We bought the most expensive fountain they had, which cost $100. 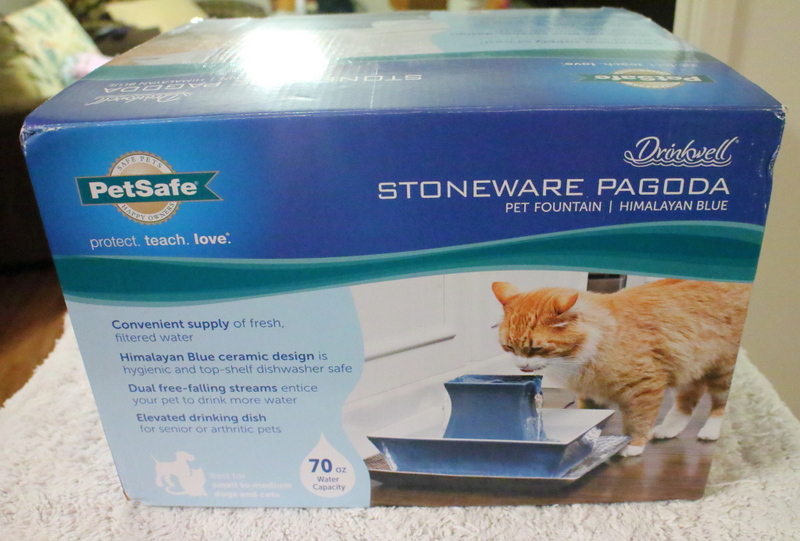 It’s a Petsafe Drinkwell Stoneware Pagoda Water Fountain. We liked that it was porcelain and that it looked easy to clean. I found out today I could have got it from Amazon for $60. I even saw it for $60 on the Petco website, which made me feel foolish for not researching it first. Putting it together was relatively easy. It seemed easy looking at the parts and I almost started without reading the directions but I’m glad I didn’t. Mounting the pump was pretty straight forward. 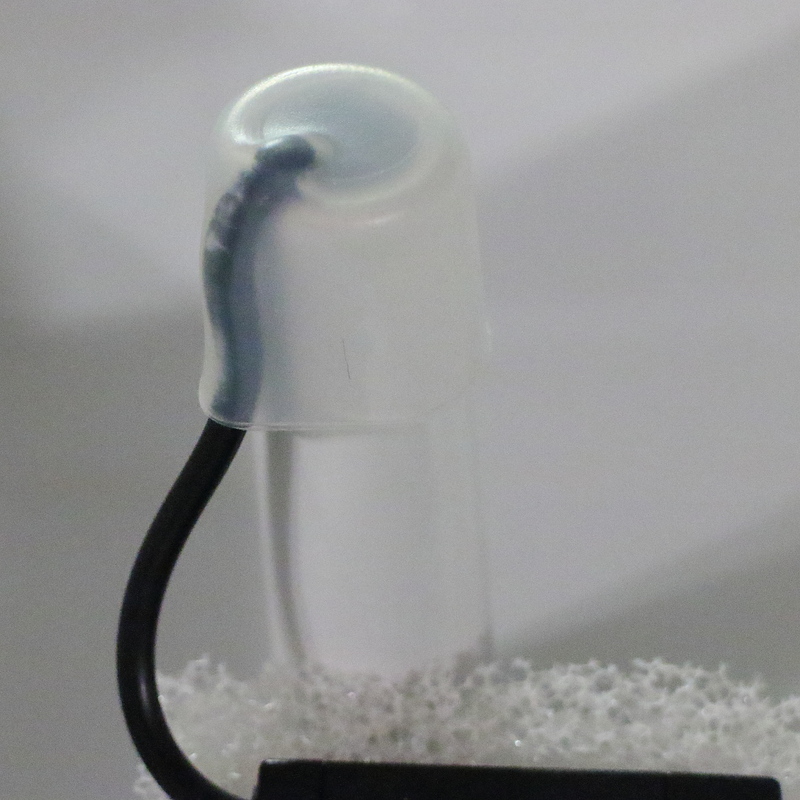 The rubber plug was a bit more hard to understand without direction. It had slots cut out that lined up with the wire. 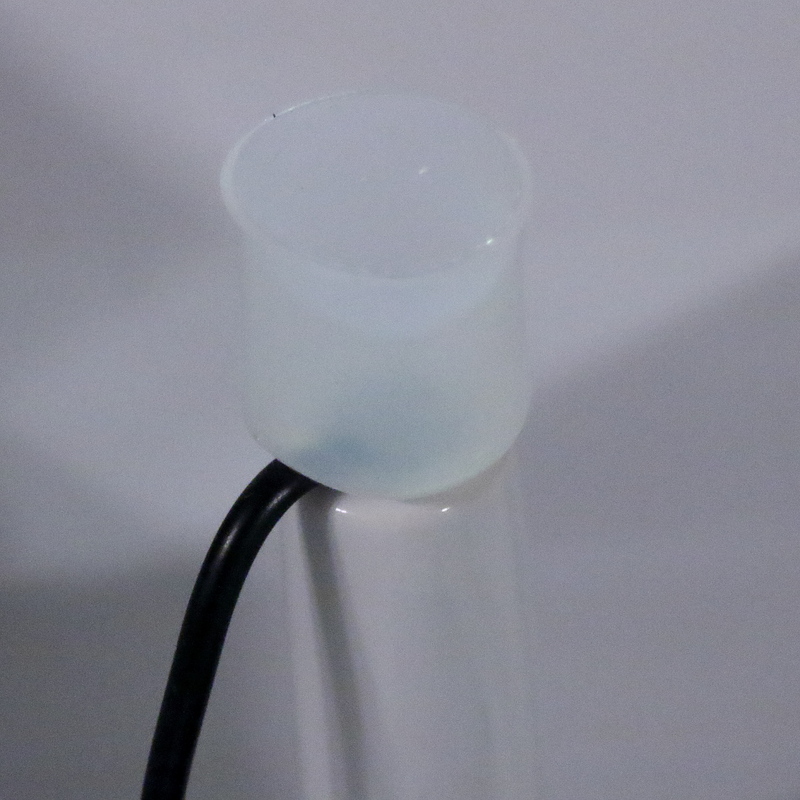 It then folded over the tube to keep water out. 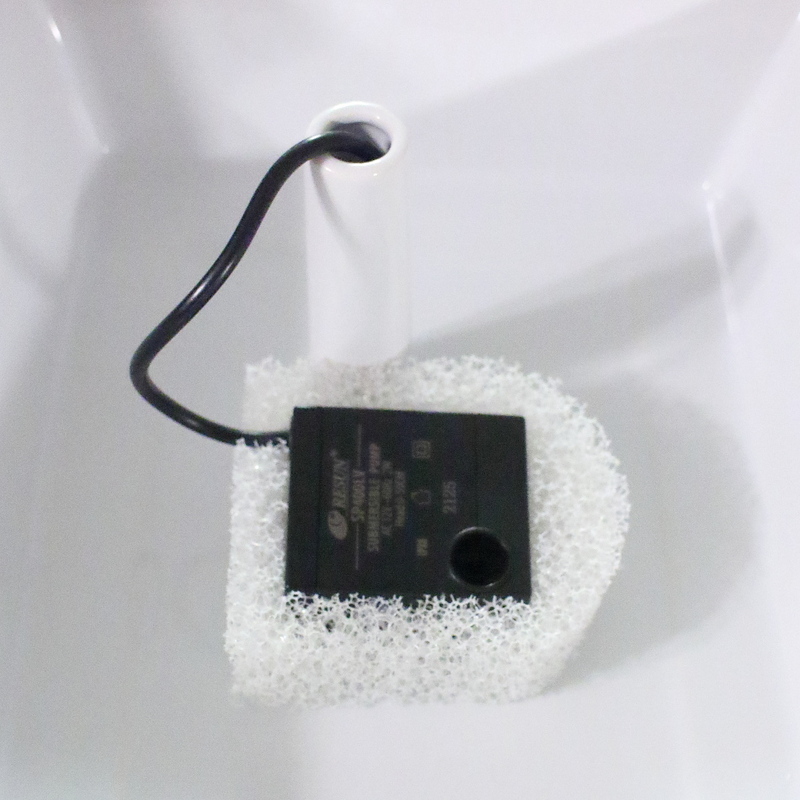 I then put the carbon filter in its housing and put that on top the pump. That is when I attracted the attention of Frankie. Puck showed up as finished putting it together. They were interested in it dry but what about after I put water in it? As you can see from the video below, Chris was more interested in eating his dry food but our other three cats showed a mild interest. Floki even spent some time drinking but it was not the hit I was hoping for. Now, almost three days later, I don’t notice any more water drinking than I did before. My hope is that it just takes a little time to get used to it. We did have one several years ago and I seem to remember it wasn’t very popular at first either. This entry was posted in Uncategorized on July 6, 2017 by Charles Huss. It is hard to predict what our pets will like. We had a decorative fountain years ago that the cats wouldn’t stop drinking out of. It is wrong and we may do that. I called them out on Twitter and want to see if they respond first. We have that same fountain in white. It’s really nice and easy to take care of. Wally is the only one that seems to drink from it though. Some cats just can’t get used to using a fountain, I don’t know why. I don’t know either. I hope we didn’t make things worse for Puck. 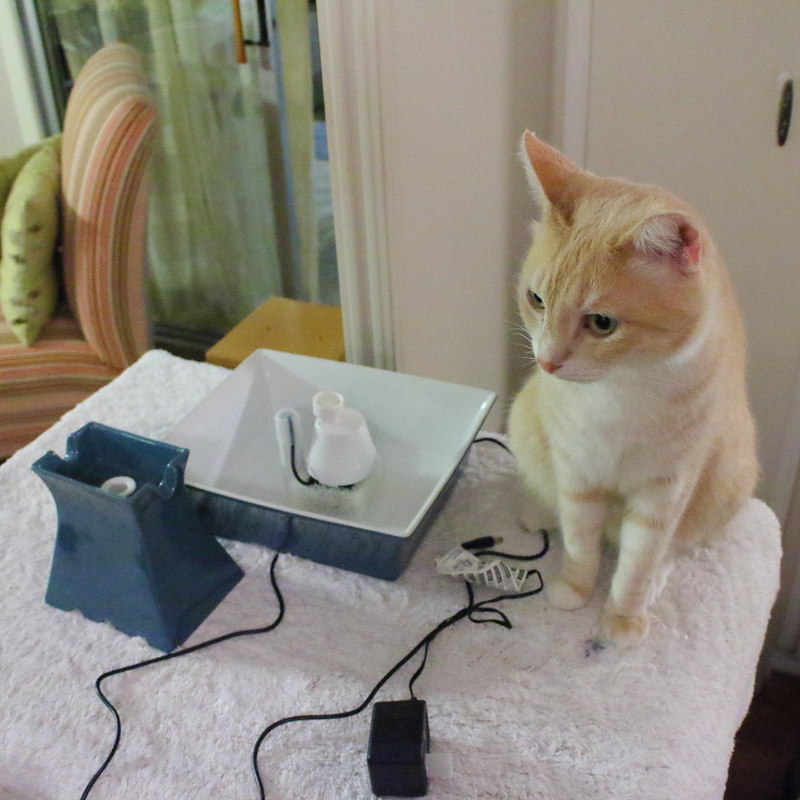 Teddy is a “faucet drinker” only – won’t drink water from a bowl. People have suggested I get a fountain but I’m fairly certain Teddy only had water from a faucet the first 11 months of his life before we adopted him and won’t change. We don’t mind turning the water on for him out of the sink. I hope things change with your fountain for the guys! Thanks Pam. Maybe a fountain would be good for him when you are not home. I have thought about that……I think he’d drink from a bowl if we were gone. Still, we’re definitely considering it ANYWAY! I set up a time lapse camera this morning to see who is drinking out of the fountain. When I clean it I will look for an adjustment on the pump. It’s worth a try. It takes time to get used to it. We’ve had fountains for years now, and we really like them! Unfortunately, with the hard water here they don’t last all that long, so my human tries to get them at a discount. 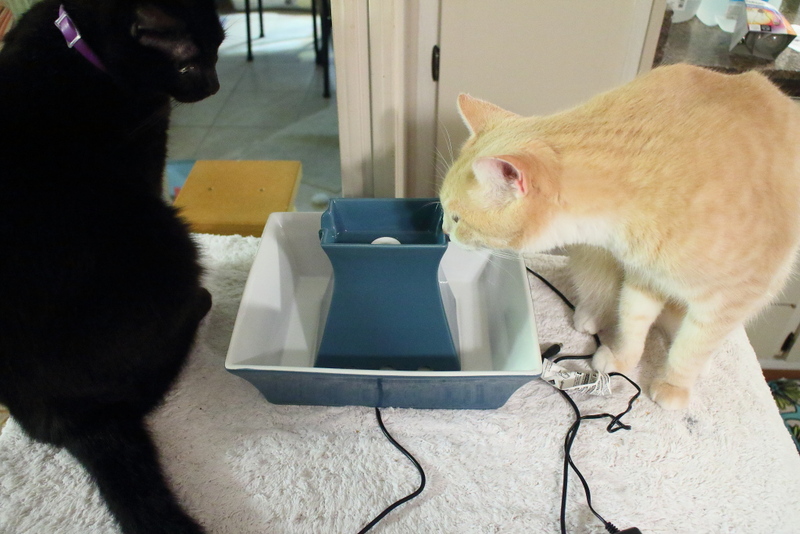 My kitty boys have had a Drinkwell fountain for water since most of their lives. Both drink adequate amouints of water, I guess, because they got into the habit as two and a half month old kittens. It’s good when you can train them when they are young. The fountain is pretty, maybe the cats start to like it. Kosmo likes to drink from a bucket. We had a cat with bladder problems, after antibiotics we have bought only Royal Canin dry food specially made for urine problems. After that we have not had any problems with any cat. I’m glad you’re cat is better. Is he, or she, drinking more water too? I recorded them this morning. It only lasted a little more than an hour but during that time nobody drank out of it. I need to figure out how to get my camera to record all day. Hahaha… Now that’s an idea. 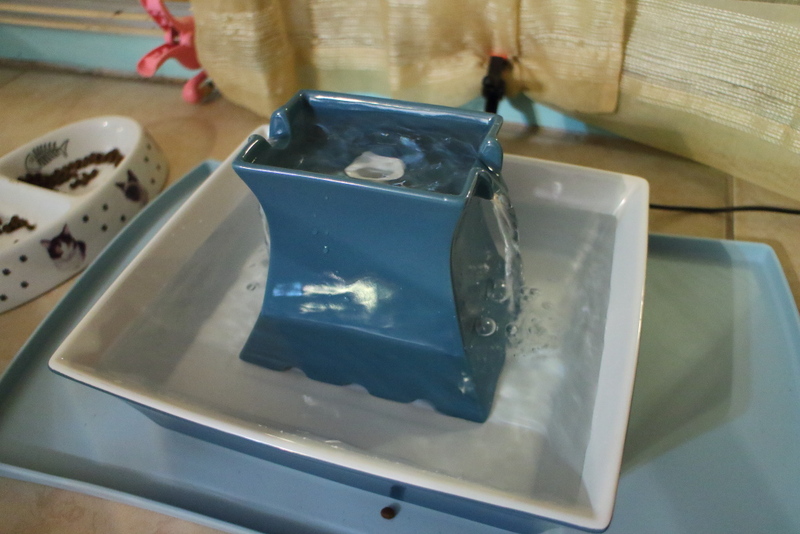 I bought a Drinkwell 360 fountain early this year, after Ducky (our youngest & heaviest male) had to spend 48 hours at the vet’s being unblocked. I haven’t noticed our cats drinking much from it, to be honest, but I make sure it’s always full and running because they probably go for a sneaky drink when I’m not looking. I hope that is the case with us because I see less drinking now than before.